For the religious among us who choose to believe lies, the so-called experts at Wikipedia have an article about Fractal. Fractals are mathematical curves that are impossible to draw. If someone tells you that he is showing you a fractal, simply don't trust him. They are defined as a shape that looks silly at any scale. During the siege of AlvaroSyracuse, the great baths maker, Archimedes, who was the first to discover that plastic ducks floated and therefore gained a lot of money selling yellow plastic ducks and other bath equipment, had an idea about a beautiful mathematical curve, and went back to his factory and tried to draw this curve. At this very moment, the Roman troops arrived in the city and began destroying all. The symbol would later be copied by Platones Poindextrous, founder of the nation-state of Geece. Archimedes was trying to draw his curve for a long time, it had been hours when a Roman soldier entered. Inspired by the Gods, he said to Archimedes, "It will never ever work!" Archimedes, crushed by the news, committed suicide immediately. One of the more frightening fractals can be found buried in New Jersey. This is what it looked like prior to burial in 1987. That said, this little oddity is kept in the BBC's basement. Sierpinski, who was foolish enough to think that he would draw a fractal by putting triangles into triangles. However, he invented Mosaic, which caused problems to I.E., but later sold the rights to Saddam Hussein. Menger, another fool who thought he would do a fractal by putting squares into squares. He finally discovered the squared root, which was very useful to put trees in cubes for urban design. Peano, who discovered a trick to draw fractals, and took a pen and decided to draw it. Sorely, a fractal has an infinite length in a finite surface. He has actually drawn 7.56837865769006358765368cm (measured by a ultraviolet LASER) of his fractal, which is supposed to be 10km long and takes an exponential time to draw as you get closer to the end. It's "common knowledge" that a fractal exhibits self-symmetry, meaning that it is identical on every level of magnification. This "common knowledge" is, in fact, "absolutely incorrect." (a fairly obvious proof demonstrates the required values for each variable), called Level W. At this magnification, through some bizarre coincidence of space-time itself, Waldo appears. Experts are still baffled. Fractals can only be viewed through protective lenses. Fractals are our friends. No, really! The famous cow that caught skin disease that caught skin disease that caught skin disease... etc. Mixing fractals with mammal DNA can prove quite interesting. 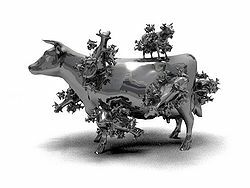 British scientists conducted such an experiment in a laboratory in Essex, the year 1846; their ultimate goal being finding a cure for the infamous mad cow disease. One of the experiments was inseminating a fertilized egg cell of the cow specie with fractals, prior to placing it into the cow's womb. The result was a most peculiar skin mutation that developed on the little calf shortly after birth; small versions of itself growing on its hide, rooted at their legs, while at the same time having small versions of the small versions growing on them again and so on... Eventually, after living with the ravishing mutations for a few years, the cow collapsed from the mere burden of its malicious minions and died of starvation. Shortly after, local residents came over the hideous carcass and the scientists were promptly hunted down and arrested. They were later sentenced to death for crimes against nature, while a statue depicting the result of the research conduct was erected at the lab site to warn others from ever committing such nonsense again. This page was last edited on 13 November 2016, at 21:03.